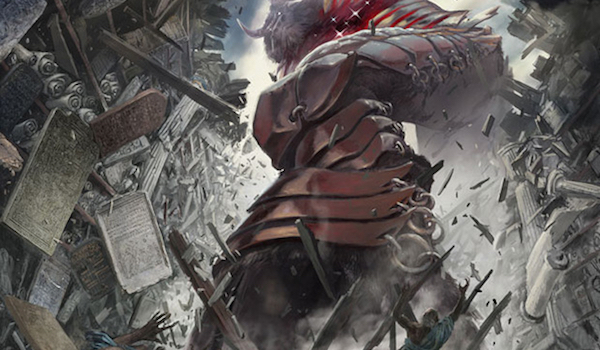 My Eldrazi Stompy article from last week was relatively well-received, but some users had questions about my updated Monkey Grow deck from the week before. They’re in luck—I took the deck to a Face to Face PPTQ and went 4-2, loading up on insights along the way. This was my third PPTQ with the Bedlam Reveler-featuring Monkey Grow (I went 3-2 in the others). I played my original list for the first two, but made some changes going into the third one. In the previous events, Simic Charm had underwhelmed me as a two-mana Vapor Snag most of the time. Hexproof mode and Giant Growth are a lot less relevant when it’s so easy to grind out decks running fatties using Bedlam Reveler. Given Montreal’s penchant for Chord decks, I wanted another burn spell in the main. I made that burn spell a Tarfire to improve Traverse the Ulvenwald. I ran some mulligan tests after those events and realized I kept more hands with four basics in the deck than with five. The third Island was dropped for the fourth Scalding Tarn. Finally, I cut Bedlam Reveler #3 from the sideboard, reasoning that once I wanted to dig up the third one, I could just as easily find Tarmogoyf and take the game anyway. After all, resolving two Revelers should put the game away versus most interactive decks in Modern. A strike against running too many Revelers is that copies beyond the first in the same hand are dead, unless one gets lucky enough to trade for a Thoughtseize or Mana Leak. In the third Reveler’s place, I added a Roast to hedge against roadblocks like Reality Smasher and Tasigur, the Golden Fang while giving me extra game against the creature decks that could get under my Traverse plan. 61 players registered for this Face to Face PPTQ, making it a six-round event and my largest this season. After I’d asked all 60 potential opponents if they would trade me a set of Eldrazi Mimics (no), pairings were announced. Linear, straightforward, and soft to counterspells, Storm is exactly the kind of deck Monkey Grow loves to face. I open the game with Delver, let my opponent cantrip, and Mana Leak his Pyromancer Ascension after blind-flipping and swinging for three. Delver gets Grapeshotted for three next turn, preventing me from saving him with a Shoal. I tap out for Tarmogoyf and Shoal my opponent’s Goblin Electromancer instead. After a hit from the tribal-infused Lhurgoyf, my opponent has one turn to win but fails to go off without an enabler on board. We both mulligan to six, and I scry a land to the top. Probe shows me Polluted Delta, Mountain, Manamorphose, and a pair of Goblin Electromancer. I Bolt the first Electromancer after he resolves, then Shoal the next one after tapping out for Tarmogoyf. Bolt and Grapeshot team up to kill this Goyf after I get in two attacks and bring my cantripping opponent to 10. I have Leak and Denial, but can’t stop the storm triggers after letting the Bolt through. Instead I throw a Bolt on the end step and resolve Hooting Mandrills on my turn. Mandrills connects after I Leak a Pyromancer Ascension. My opponent tries to go off at three life but loses to a ferocious Stubborn Denial on Past in Flames. This matchup is hard to lose. Storm has trouble removing large, green threats, and Stubborn/Shoal makes it challenging for them to resolve anything that matters. Monkey Grow fares better against Bogles than most other strains of Delver thanks to Disrupting Shoal. Our plan in this matchup is to race on the ground and in the air while keeping opponents off lifelink (and sometimes trample). We aggressively Shoal threats in the early game to slow opponents down while we establish a clock. My opponent starts at six cards, and I’m not so lucky. I ship a slow hand into one with Mountain as the only land. My five-carder has Disrupting Shoal, so I keep. (By this point, I’ve scouted most of the room.) I’m able to Shoal a Bogle and follow up with Delver and Mandrills, but my threats don’t start swinging until turn four, and by then my opponent has drawn Kor Spiritdancer. My untapped Stomping Ground doesn’t stop him from suiting it up with a hand full of auras and attacking me for 10. Spirit Mantle keeps me from chumping. Probe shows me a seven of Hyena Umbra, Spider Umbra, Path to Exile, Daybreak Coronet, Ethereal Armor, Temple Garden, and Windswept Heath. I land a turn one Delver and follow up with Hooting Mandrills after Shoaling a topdecked Silhana Ledgewalker. My opponent fetches up Dryad Arbor and tries to give it Spider Umbra, but I Tarfire the land in response. Then I Shoal his Path to Exile, play a second Mandrills, and swiftly attack for lethal as my opponent fails to find another second land. I Shoal a Gladecover Scout and commit Delver, Mandrills, and a 5/6 Goyf to the table. But I don’t see a Bolt, and my opponent goes for Dryad Arbor on the end step. He makes it huge with Daybreak and friends, and a vigilant attack puts him up to 15 from 7. I scry Tarfire to the top of my deck and Probe into it, hoping my opponent will order damage on the Goyf first after I triple block and I’ll at least get to trade my team for his threat by growing Goyf to 6/7. But he topdecks a second Coronet, and this line wouldn’t have worked anyway thanks to totem armor. I still think it’s right to cut Snag in this matchup, since the threats I can target can also be killed by Bolt. But in that case, it’s definitely wrong to cut Bolts. My misboard here may have cost me the match. I’ve championed not packing any graveyard hate in the Monkey Grow sideboard since Dredge broke out, but at the time of this tournament, I hadn’t actually done much testing against the post-Syracuse versions of the deck. Our plan is to race Dredge with efficient threats while stifling their early game with shoal. My interactive hand with Snapcaster and Bolts is no match for turn one Shriekhorn into Insolent Neonate. Probe also shows me Conflagrate, Prized Amalgam, and Golgari Grave-Troll (he soon dredges into two more copies), and I know I’m in for a beating. Disrupting Shoal finds its way into my hand two turns too late. I keep a very fast hand to my opponent’s slow one. Turn two I land a 5/6 Tarmogoyf, followed by Hooting Mandrills. I throw two Bolts at my opponent at the end of his fourth turn, and tag in for lethal before he can establish a competent board. Revelry comes in from the sideboard to remove Leyline of the Void, which my opponent milled last game. Fortunately, my opponent again fails to open it. I keep a one-lander with Delver, Bolt, Tarfire, Scour, Visions, and Leak; I then draw Probe, which shows me his shaky six of two Neonates, Bloodstained Mire, Copperline Gorge, Troll, and Stinkweed Imp. I play Delver to lay some fast beats, and my opponent topdecks Faithless Looting to dump Bridge From Below and a dredger. The pair of Neonates resolve soonafter and trick me into Tarfiring my Delver (they tricked me man!!!) to remove the Bridge. Of course, the Neonates are sacrificed in response. I purposefully don’t flip my next Delver to put Misty Rainforest and Tarmogoyf on top of the deck. Two turns later, Delver flips and I resolve Goyf. Meanwhile, I’m taking hits from Bloodghast and an Amalgam. My opponent cracks in with both to bring me to 10 life, and I crack back for seven to tie the life totals. I fetch and Serum, scrying Tarfire on top of the deck to make an exactly lethal attack with Delver and Goyf next turn, and pass. Amalgam and Ghast hit me down to four. My opponent taps out for Grave-Troll and I get to spend my Leak before burning his face and attacking for game. I’m okay with this matchup. Tarmogoyf works wonders when it comes to racing, since he can also wall attackers to slow the assault while Delver or another Goyf crashes into the red zone. It helps that the green giant is so giant in this matchup thanks to Shriekhorn and Leyline of the Void, which turns off Hooting Mandrills but doesn’t much affect the size of our Lhurgoyfs should it hit the battlefield. Shoal helps immensely to slow Dredge down, although I didn’t draw it in this match. If we decide to actually run hate cards for Dredge, I would avoid the easily killable Grafdigger’s Cage. Traverse the Ulvenwald turns a single sideboard Bojuka Bog into a searchable Tormod’s Crypt. Jeskai and Jund are the two big interactive decks in Modern, and the primary reason to play Bedlam Reveler in this deck. Reveler also excels against aggro, but so does Huntmaster of the Fells, who can be comparatively lackluster against midrange. I lead with Delver of Secrets and Stubborn Denial a Path to Exile during my upkeep. My opponent has two more Paths, and removes both Delver and my turn two Tarmogoyf. I don’t find another threat during this game, instead drawing almost exclusively lands despite resolving a pair of Serum Visions. The deck actually runs out of searchable lands. My opponent promptly stabilizes and kills me with Bolts and manlands. I keep seven cards with two Traverse, two Serum, and cantrip for a few turns to hit my land drops and fill the graveyard. My opponent expects me to make the first move, so I wait to have six lands before trying Blood Moon. He has no basics in play, and the moon gets Remanded. I pass, throwing some Bolts on his end step to prepare for Reveler. The Moon sticks on turn seven, getting around a predicted Mana Leak. My opponent uses his soon-to-be-red blue source to cast Snapcaster Mage and Bolt me twice. I Snag his Snap, play a Delver, and start Reveling. He scoops to the second Bedlam. My opponent opens the nut draw: turn one Colonnade. I opened Reveler, Tarfire, Traverse, and a pair of Probes, which I cast. They show me Supreme Verdict, Goblin Dark-Dwellers, Bolt, Dispel, Sulfur Falls, and Scalding Tarn. I Tarfire my opponent during his second turn to Traverse into Goyf and play it on turn three. Goyf sticks, and I start attacking. My opponent eventually casts Verdict, to which I respond by Snagging the Goyf. I untap and resolve Goyf and Reveler. At just 10 life, my opponent realizes he’s dead to an attack and two prowess triggers. I’m at 9. He throws two Bolts at me and goes for Snap-Bolt on his main phase; I let the Snap resolve and Deny the Bolt. My opponent still has the Snap to block Tarmogoyf and Dwellers in hand for a Bolt next turn. I need to draw Mana Leak or a removal spell, and topdeck Vapor Snag, which along with Serum Visions also gets me to two prowess for a lethal attack. Jeskai Nahiri has a lot of trouble stabilizing over Beldam Reveler, so giving them opportunities to just burn us out might not be the best plan. Aggressively Probing is dangerous in this matchup and I may have played carelessly. I honed this matchup last summer, when Elves ran rampant after a breakout performance at GP Charlotte. The deck has changed very little since then compared with Monkey Grow. We’ve historically wanted to kill mana dorks early on, then transition to killing lords, all while clocking. Now, we want to trade resources as much as possible, and pull ahead or find Pyroclasm with Bedlam Reveler. I ship an otherwise reasonable hand with no Bolts and keep Thought Scour, Hooting Mandrills, Bolt, Scalding Tarn, Gitaxian Probe, Stomping Ground. My opponent leads with Llanowar Elves off a Cavern of Souls. Probe shows me Heritage Druid, Elvish Visionary, Shaman of the Pack, Collected Company, and Nykthos. I Bolt his dork and he topdecks another one. I Scour myself to find a Bolt for it, but no dice, so I resolve Mandrills instead. My opponent draws mana sources and double CoCos in the next two turns. Mandrills can’t race double Archdruid, double Ezuri. I mulligan once, keeping two Moons, two Pyroclasms, and two fetches. My opponent goes to five. His first dork lives, and when he goes for a bigger board, I wipe it. Shaman of the Pack is the funeral procession, and Moon locks my opponent out of colors. I Pyroclasm away the Shaman and eventually draw into two Goyfs. My opponent mulligans once and I keep seven. I trade resources decently and resolve a 5/6 Tarmogoyf. Then I neglect to Shoal a lonely Heritage Druid, and my opponent punishes me for tapping out for Moon championing it for Wren’s Run Packmaster (he has Forests), which I scramble to find two Bolts for. The Packmaster goes down after pumping out a single Wolf and leaving me with a hand of double Stubborn Denial and Shoal. I land a second Goyf, and Probe my opponent to see Wurmcoil Engine. The Denials protect me from Company and Chord, but I can’t do anything about a hard-cast Wurmcoil Engine right now. At this point, my opponent has five lands, a Wolf, and two Elves in play. If he draws another Elf, he’ll be able to tap all three to Heritage and make the Wurmcoil. I cantrip furiously for a Leak or Snag while he draws blanks for two turns, but then the Wurm comes down. I draw Mana Leak the following turn (ho, ho!) and have to double-block the Engine to get it off the table, losing both my Goyfs in the process. Bedlam and Traverse elude me, and I lose to the tokens. I felt pretty confident this game with my grip of Denials, but never considered the possibility of a hard-cast Wurmcoil Engine. Wren’s Run Packmaster is also a card I had to read, and it’s possible the Bolts I spent on that creature would have allowed me to overcome the Engine. But the two together were enough to overpower me. My favorite kinds of losses are the ones where something I didn’t even account for ends up beating me. Still, this loss put me out of contention for Top 8. This matchup is great for us, even though we struggle to win Game 1. We have to race there, a losing proposition. Affinity can’t realistically weather our post-board removal suite. Looking for interaction, I mulligan to six. Probe shows me an extremely suspect hand of Glimmervoid, Blinkmoth Nexus, Master of Etherium, Galvanic Blast, Thoughtcast, and two Memnites. I Shoal a Plating and start hitting with a Goyf, but a timely Etched Champion stops me from attacking. My opponent draws a Steel Overseer for my Bolt and another for his team and beats me in the air. This game, Probe shows me Ornithopter, Memnite, Spellskite, Blast, Blinkmoth, Inkmoth, and Citadel. Another hand I wouldn’t have kept, but hey, I lost the last time that thought went through my head. I do take this one though, thanks to two Goyfs, Bolt, and a topdecked Roast for the Spellskite. My opponent is mana screwed as I blind-flip Delver. 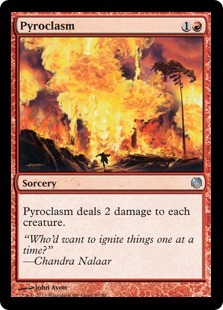 I scry Pyroclasm to the top and swing a few times, wondering if my opponent will start chumping with Ornithopters. He doesn’t, eventually drawing a second mana source and casting Arcbound Ravager. I Shoal it and attack for three. Next, he casts Steel Overseer. I attack one last time, putting my opponent to 8, and Pyroclasm, also destroying my Delver, two Thopters, and a Memnite. Another Ravager comes down and I kill it with Destructive Revelry. My opponent doesn’t sacrifice it to fizzle the spell, and two Bolts kill him while I have Leak, Reveler, Traverse, and Grudge in hand. After three tournaments, I’m beginning to get a tighter grip on what the deck needs. While I flirted with a third Vapor Snag (over the extra Tarfire), I’m generally happy with my current mainboard configuration. I can’t quite say the same about the sideboard. Going forward, I’m making the following changes. The Roast was great for me, but I didn’t like how expensive it is, that it doesn’t hit fliers, and that opponents can Spell Snare it. I still wanted a second heavy-duty removal spell in the side. 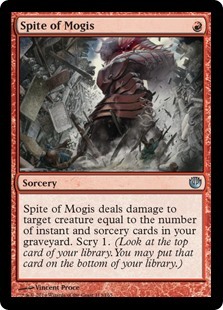 A new card I’m toying with solves most of Roast‘s issues: Spite of Mogis. Here are Spite’s pros and cons compared with Roast. Spite’s most obvious drawback, that it does nothing in front of grave hate, isn’t a death knell for the card. Chances are we’ll lose to that Rest in Peace anyway. And Roast won’t kill a Flickerwisp regardless. Spite’s many upsides have me wanting to try two despite this shortcoming. There’s nothing like a flavor win to make a fringe deck viable. Just ask Jeskai Nahiri. So what better artifact removal spell to play alongside Beldam Reveler than Destructive Revelry? In all honesty, Ancient Grudge synergizes much better with the Devil, since cycling Grudge doesn’t prevent us from casting it later. My Affinity matchup is good enough that I’m happy cutting the third artifact hate spell for a second Roast effect. But I still want two ways to remove Rest in Peace. That means we can’t play Grudge anymore. Natural State, for its part, is cheaper than Revelry, but doesn’t answer the suddenly-played Leyline of the Void (to say nothing of random haymakers like Batterskull and Worship). Or Chalice of the Void, which laughs at State and probably kills us if we can’t get it off the table. If we’re going to play only two artifact removal spells, I’d rather have the most versatile ones. Magic is a game that constantly challenges its players. Every match brings answers, but it also raises more questions. Nowhere have I found this truer than with Monkey Grow. Will Spite of Mogis actually work? Or does it belong in the bulk box? Am I about to go 0-6 against two triplicates of Affinity players? Or will my Revelries hold down the jungle hut? Find out next week on Modern Nexus! Correction: I was one of those 61 players, and you never asked me for Eldrazi Mimics. PS. Good write-up. I look forward to going back to Grow! Doesnt spite of mogis deal zero without a instant or sorcery in gy? That hurts your ability to zap turn one mana dorks (probe notwithstanding). Youre not casting roast until turn 2 anyways so its less of an issue in a heads up comparison, but unless im misreading the effect it could be awkward in the early game when you want to nuke something small. Nope, you’re reading correctly. But unlike Roast, Spite at least has the possibility of killing a dork on turn one, whereas Roast does not. And between Traverse, Probe, Serum, Shoal, Bolt, etc. it’s pretty rare that a turn two Spite won’t kill an x/1. Roast is better in certain early games, but I’d argue that spending two mana and a valuable removal spell to deal with Hierarch is awkward more of the time than Spite not having enough i/s in the yard is. Spite does seem interesting in a shell with 50% i/s. Spite of Mogis does not count itself when resolving. So it deals 0 damage on turn 1. You say it kills dorks turn 1. Am I missing something? A turn-one Gitaxian Probe enables a turn-one Spite for 1 damage. As he said, it’s rare, but unlike with Roast it’s at least possible. Not gonna lie I didn’t read all the tournament reportsyet and while I follow this deck closely through your writings, I can’t remember if you’ve answered this, but is there a reason you don’t just run dismember? I understand the drawbacks and it certainly doesn’t answer the creatures you listed with spite (though I’ve always thought you had to bite the bullet and take tarmo as your best answer to those kinds of creatures, particularly with the traverse enablers), but I think it can do what you need enough times to do what you want. I appreciate your quest for the holy grail in these colors but fear it is an insanity-inducing exercise. I love the idea of spite tho. You keep trying things and thank you. As I said there, I brewed the UR burn deck the morning that article was published. I also don’t like it, which is why I didn’t chase the thread. I also tried a more interactive UR deck with Shoals and just didn’t like it as much as I did with Tarmogoyf. Goyf just fits so well into interact-while-attacking URx decks in Modern, and Traverse’s synergy with the Reveler is another huge draw to the green splash. One more question for you Jordan: I’m sure you’ve tested Faithless Looting in this shell as a Traverse enabler; was the fact that FL isn’t blue what made the card unplayable? FL seems close enough to Serum Visions to be a viable replacement, and it also has flashback so pitching to Reveler in games 2 and 3 doesn’t feel bad. Second, on FL in this deck: The Monkey Grow core is so tight that we just can’t fit a Looting. The main reason to play this deck over the Reveler Delver decks I first brewed, which had Bedlam in the main, is that Monkey Grow smashes Modern’s linear decks. Diluting the core would defeat the purpose of playing it at all. So we’d have to play FL in the sideboard, and as evidenced by the article, we really don’t have room for it (not that we’d even want it!). Thanks for the reply! I really hope that this deck keeps putting up great results for you. We need moar Temur in Modern :).